For us who each day move lots of code from Vb6 and VB.NET to MVVM. ASP.NET MVC, etc, this kind of tools become very handy. Crystal Reports was a tool very used by VB6 developers. Sometimes when you are migrating a VB6 applications, you find a lot of reports created with this tool. What should you do? Should you rewrite them on another technology? Well that really depends on project requirements, but Crystal Reports has good support for VS2010, both for 32 and 64 bit environments. So you don't need to throw away your reports you can still use Crystal Reports. However that hard thing to do is where to find Crystal Reports for VS. Do you need to buy some software for that? 2. 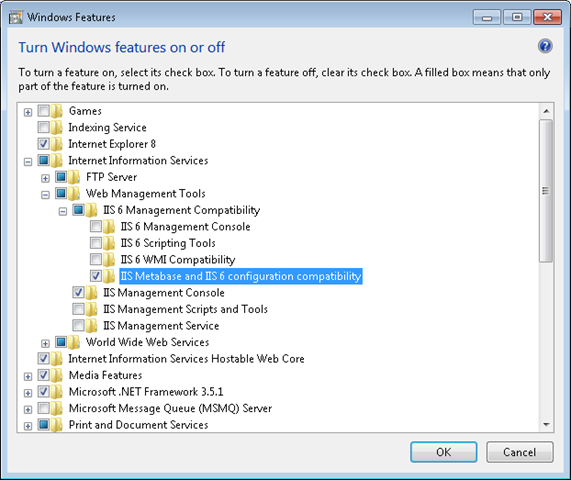 Give access to the user executing the IIS process to the path for the Temp Folder (C:\Windows\Temp or the corresponding folder on windows installation). 3. 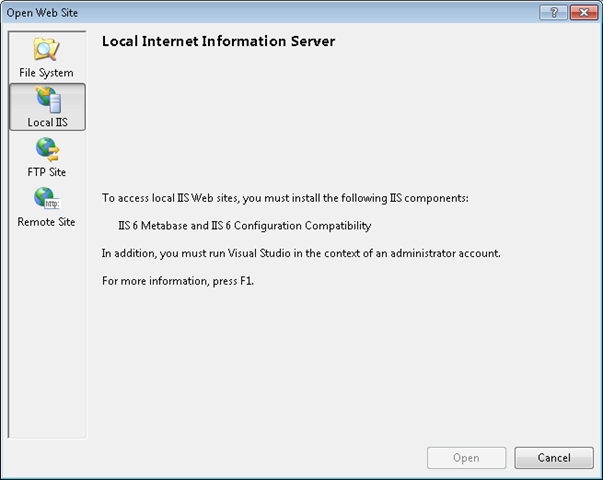 Download the "Microsoft SQL Server 2008 Feature Pack", where you can find the "Microsoft SQL Server 2008 Native Client ". 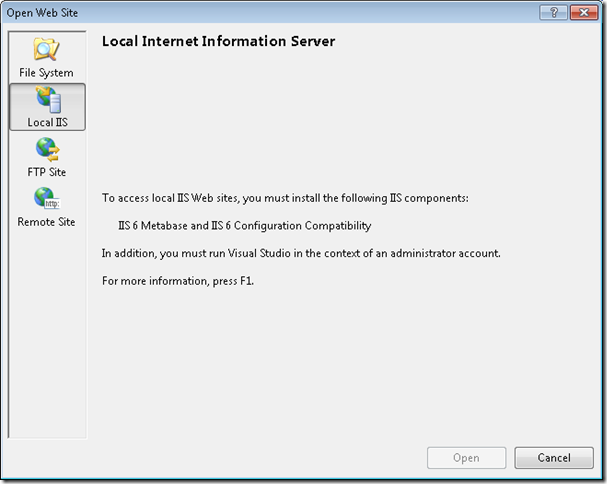 Download the corresponding installer according to the platform of the server (x86, x64 or IA64). 1. Download the "Complete Package" for development on Visual Studio 2010. Please be sure that if you're on a 64 bits machine, you check the "Install 64 bits Runtime" before you click on finish when you complete the installation. 3. If you don't have the Microsoft SQL Server 2008 Native Client Provider (sqlncli10), download the "Microsoft SQL Server 2008 Feature Pack", where you can find the "Microsoft SQL Server 2008 Native Client ". 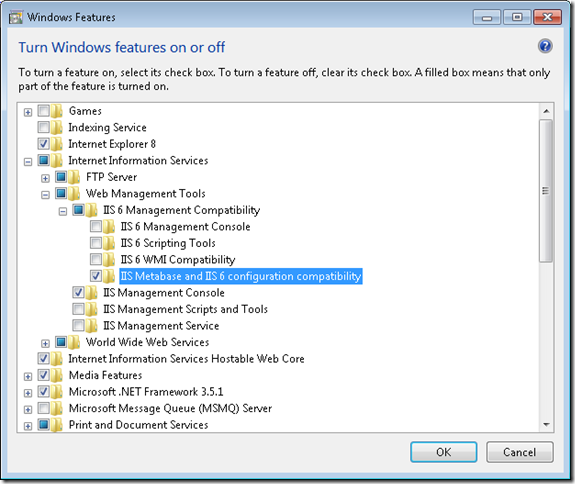 Download the corresponding installer according to the platform of the server (x86, x64 or IA64). 4. 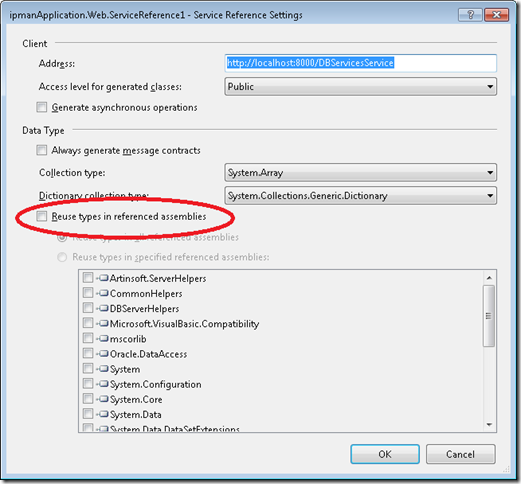 To create a new report please be sure you use a "OLE DB (ADO)" Connection and that you're using the "SQL Server Native Client 10.0" Provider, and use the right login information. If the report was previously created with a different provider, please change it on the "Set Datasource Location", editing the Provider field. The VS Profiler Team has an excellent post teaching how to use the VS2010 profiler with Silverlight Applications. 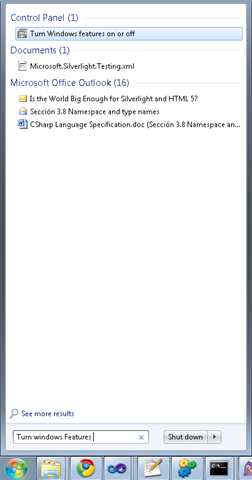 When the finish you will have a file called MyFile.vsp and just open that with VS2010. I have been looking for a solution but have not found anything yet. a) Close all windows. Do a Clean and a Rebuild or Close Visual Studio and open it again. In .NET Framework 2.0 the attribute configSource was added to several elements of the .NET config files so you could use external files. Sadly those attribute are not available for the system.serviceModel.However I found this post that shows a interesting workaround. everything seemed to work in the wizard but no code was generated. What I did to solve this issue? 3. 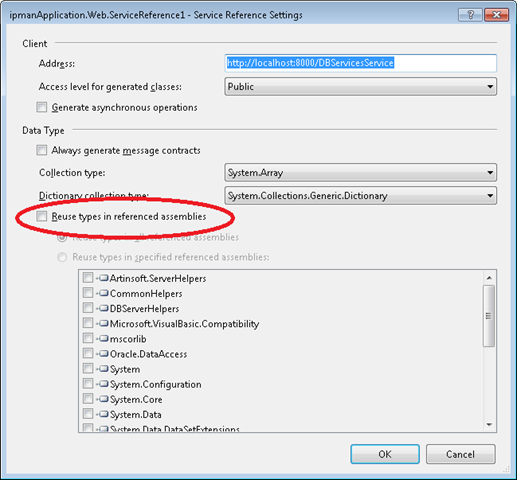 Uncheck the option that says Reuse types in referenced assemblies. After that VS generated the code and I could use the WCF service. For the record I have Windows 7. We have seen a situation that can be a little annoying. 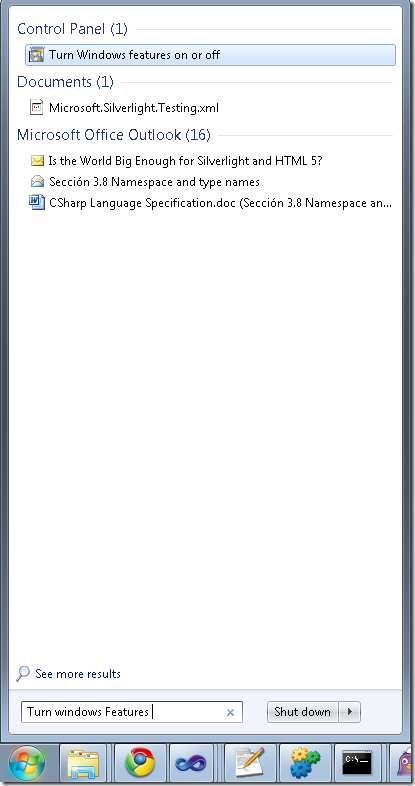 I usually find that situation in ASP.NET projects, but it can also happen in Winforms. dependencies could not be loaded. 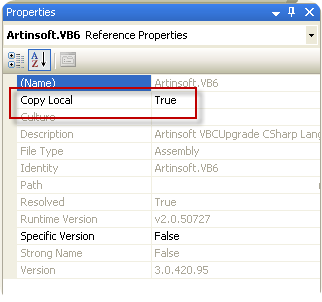 1) Look at the bin\debug or bin\release and make sure that the assembly is in those directories. I’m an enthusiastic user of DXCore and I have been working on some extensions of my own. But I could not find the DXCore or DevExpress menu. Well there is a hack for that. This should make the "DevExpress" menu visible. Look at the post for more details and keep enjoying DXCore. In the VB6 world it was very common to use “Resizer” OCXs that you just put on your forms and that they handle all the proportional resizing needed if you changed your form. It was very simple and easy. All of them seem to work. So it really up to your company preferences, budget and the level of support you desire. I haven't made tests like how it behaves if you have thirdparty components or activex ??? maybe I'll review that later.